Prop up your fuzzy hobbit feet by the fire, grab a mug of piping hot tea and a plate of Bilbo's fresh-baked seed cakes, and settle in for a riddle and game-filled teatime. 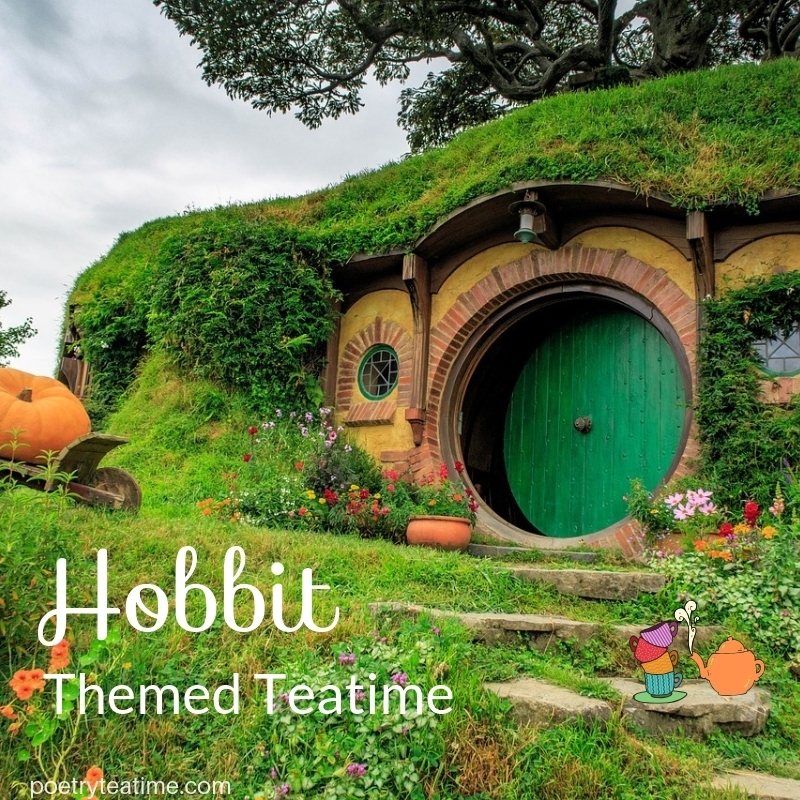 Today's teatime celebrates the wonderful talents of Tolkien and the playful world of The Hobbit! Do you recognize this riddle? "A box without hinges, key, or lid, / Yet golden treasure inside is hid" (find the answer at the bottom of the page, #1). If you've heard it before, chances are you've read J.R.R. Tolkien's The Hobbit! Although Tolkien is better known as an author whose works inspired the modern-day fantasy tradition, he was also an excellent poet and riddler. Not only was Tolkien an author, he also fought in World War I, taught Old and Middle English at Oxford, and invented languages as a philologist. Learn more about Tolkien's fascinating history, which spans the globe from South Africa to the midlands of England, here at the Tolkien Society. In The Hobbit, Bilbo and Gollum play a riddle-game in which they try to stump each other with the most difficult riddles. In the first edition of the book, Gollum gives Bilbo the ring as a present for winning the contest. Later, Tolkien changed this to tie the book into Lord of the Rings and to reveal the ring's corrupting nature. In the revised ending, Bilbo actually tricks the ring away from Gollum and lies about how he "won" the ring. Go ahead and challenge yourself with a few of the riddles Bilbo and Gollum exchange! The answers are at the bottom of the page. You can also listen to Tolkien himself reading the chapter "Riddles in the Dark" here on YouTube. Although Tolkien created his own riddles in The Hobbit, he was also an expert in the long tradition of riddles in Anglo-Saxon poetry. Traditional Anglo-Saxon riddles used alliteration and repeated rhythms for emphasis rather than rhymes. They were often about warfare and battles. Here is a modern-day example by Eric S. Raymond written in the style of an Anglo-Saxon riddle (read more here). See if you can guess the answer! I await the sword's kiss. To learn more about the riddles in ancient English poetry, check out Michael Alexander's The First Poems in English. Alexander translates several Anglo-Saxon riddle-games which were some of J.R.R. Tolkien's inspirations. Do note that this book is more academic and features descriptions of ancient violence that make it more suitable for older teens. 6. I have streets but no pavement. I have cities but no buildings. I have forests but no trees. I have rivers but no water. Find more riddles for the whole family here at Plentifun. Arrange your description in lines. You can use alliteration or rhyme, and be sure to end with "What am I?" Dazzle your friends and family with your riddle! For more help composing your own riddle poetry, check out this post from Poetry Teatime and this guide by Kenn Nesbitt. Lembas bread: This Elvish bread isn't introduced until the Lord of the Rings, but we think this sweet and filling shortbread is perfect for teatime. Find the recipe here from The Council of Elrond. Bilbo's seed cakes: A Hobbit-themed party isn't complete without Bilbo's favorite party food! Find the recipe here from The Council of Elrond. Sam's fish n' chips: While Gollum might prefer his fish "raw and wriggling," hobbits would much rather enjoy piping hot potato chips and crispy fried fish, according to Samwise Gamgee. Find directions for Sam's fish here from Feast of Starlight. Other hobbit-approved feasts: Hobbits love good food, so make some family favorites and dig in! 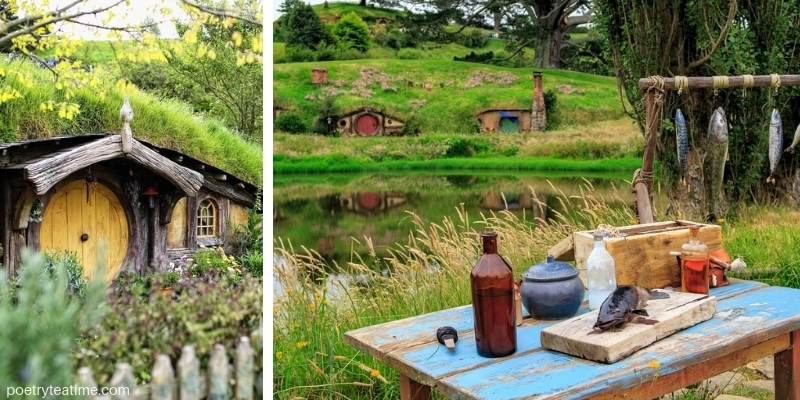 Potatoes, mushrooms, fresh bread and butter, and cheese are especially prized among the hobbit community. Any kind of cakes, scones, and tea are also bound to be a hit! Make Hobbit Feet: A hobbit party isn't complete without some fuzzy and hairy hobbit feet! Just tie some brown yarn to the straps of flip-flop sandals for the easiest possible hobbit feet. You can also wad some brown yarn into a messy ball and tie it over some fuzzy socks. May the hair on your toes never fall out! Paper lantern decorations: While we don't know exactly what sorts of decorations hobbits use, you can bet that cozy paper lanterns would be one of them! Find out how to make these with paper bags and hole punches here at eHow. Easy bunting: Do you have leftover wrapping paper from Christmas? Cut it into triangles and staple it onto some twine or yarn for quick, easy, and hobbit-approved party decorations! Set the scene: All the best hobbit parties feature lots of music, light, and dancing. If you're outside, see if you can find the perfect party tree for your feast, or if you're inside, take advantage of candles or a fireplace for a cozy atmosphere for your feast. Guess what's in my pocket: Bilbo's final "riddle" to Gollum was to guess what was in his pocket. You can create your own version of this by choosing a group of objects that everyone knows, hiding one in your pocket, and having others guess which one is hidden. You can also create paper "pockets" and fill them with mysterious items. Guessers can feel the pocket and try to guess what it contains! Inspired by these pockets and rhymes from So Tomorrow. Create your own maps: Tolkien was also an artist who created illustrations and maps for the Hobbit and his other books! Create your own maps by using directions here from Poetry Teatime. You can even set up a scavenger hunt with a map to guide people towards treasure! 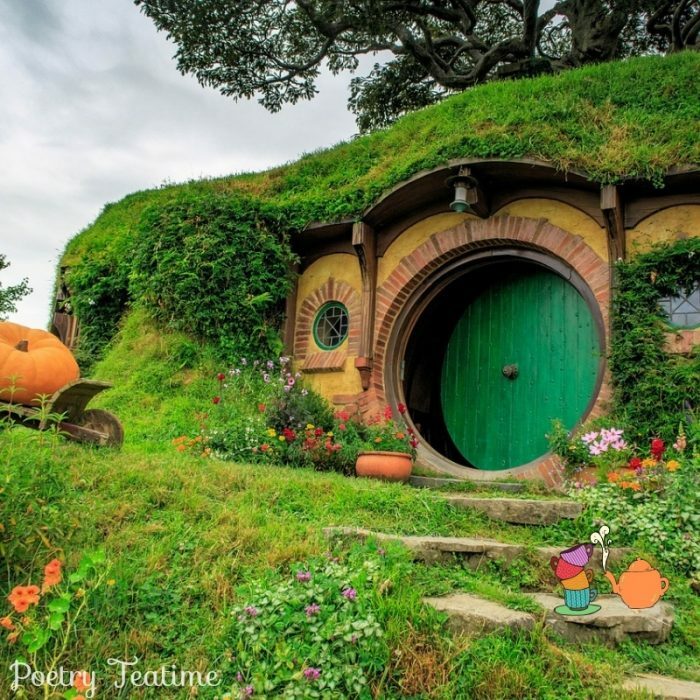 Share some sayings: If there's one thing hobbits love, it's a good proverb or saying. Collect some of your favorites and share them during your teatime, or make up a few fun sayings that you think hobbits would appreciate! Party games: Everyone knows hobbits love a good party. Why not introduce some of your favorite party games, whether board games or traditional games like statues, telephone, charades, hot potato, or musical chairs? Make a speech: Appoint someone in the group to make an impressive speech thanking everyone for the party. If you're feeling especially daring, see if you can add a subtle insult just like Bilbo did, too! If you'd like to follow in Tolkien's tradition and solve some riddles and poetic puzzles during your teatime today, you've come to the right place! We've collected all sorts of books with riddles galore for you to solve!